A set of 4 photo coasters, supplied in a holder. 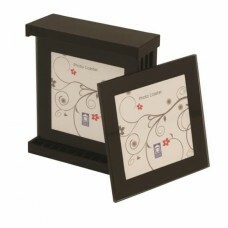 Each coaster has an 87x87mm black glass frame with a photo area of 60x60mm. The photos are slipped in behind the 3mm thick glass. Each coaster has a metal base with felt feet to avoid scratching.